Sosro Jasmine Tea in 8oz (250g) tetra pack. Teh Botol Sosro made from organic jasmine tea. Teh Botol Sosro ready to drink tea best served cold. Product of Indonesia. Halal Certified حلال . Teh botol is a tea with jasmine aroma. 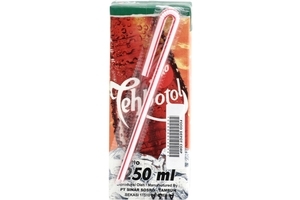 Teh botol itself is very famous on-the-go type of tea that many Indonesians can purchase almost everywhere. The sweet taste combine with jasmine aroma is very refreshing especially during summer time. The individual box can be stored in your cooler along with other soda can or bottle and enjoy it! Not only adult love this tea, kids too. Milo (Nutritional Energy Drink) - 8 fl oz. Mixed Fruit Juice (Jus De Fruits Melanges) - 12.32 fl oz. Aloe Vera with Lychee Juice - 10.5 fl oz. Calpico (Original Flavor) - 16.9 fl oz. Calpico (White Peach Flavor) - 16.9fl oz. Ramune (Original Flavor) - 6.76 fl oz.